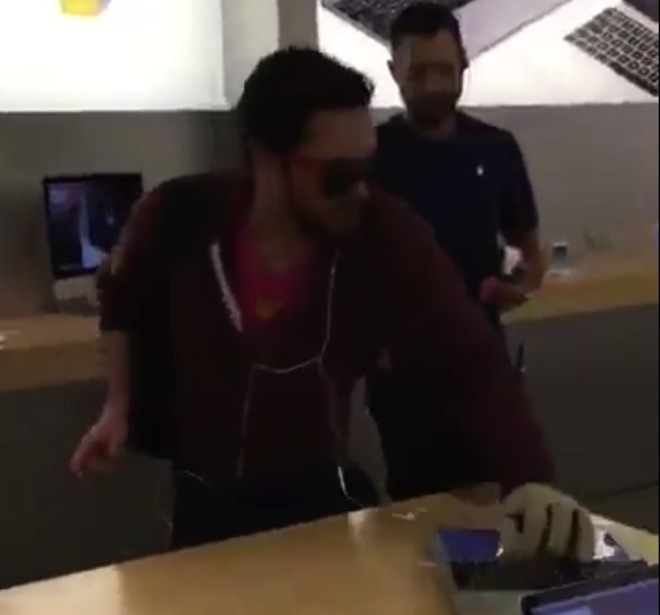 The man who smashed at least 17 demo stations at the Dijon, France Apple store on Sept. 29 had his day in court, and in addition to a six-month suspended jail sentence, he must pay Apple 17,548 euros for the damage —far short of the company's own estimate. At his sentencing hearing, Le Figaro reports that the assailant claimed to be in "in a monster state of anger" over Apple's refusal to refund him for what he called a defective iPhone. Specifics of the man's service claims beyond his declaration that the phone was not damaged by him are still not known. The judge sentenced the man to a six-month suspended jail sentence, a two-year probationary period where he is barred from the mall, and must repay Apple 17,548 ($19,186) while on probation. Apple estimated the damage to the store and equipment was closer to 60,000 ($65,600). The judge declined to award that amount, as the equipment was judged to be for display and not resale, and the police had claimed to not have had sufficient time to inspect the destroyed gear prior to the display's replacement by Apple. Wearing Apple earbuds the whole time, on Sept. 29 an unnamed customer took a steel ball used in French game Petanque (similar to Bocce), and destroyed 12 iPhones, four iMac displays, and a MacBook Air on video —but the rampage had started before the video capture had begun.